The first Three Tenors concert in Rome, Italy in 1990 was a huge success. It was so successful everybody wanted a follow-up concert. The 1990 concert was put together to mark the world football (soccer) championship (FIFA World Cup) which were held in Italy in the summer of 1990. The following World Cup were to be held in the US in the summer of 1994. 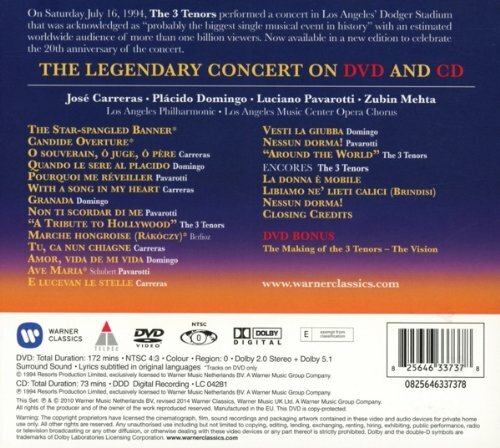 After some negotiations the second Three Tenors concert was held in Dodger Stadium in Los Angeles on July 16, 1994. As the 1990 concert this concert was also held at the eve of the FIFA World Cup Final. The 1990 concert was put together on relatively short notice as a charity concert, but the 1994 concert was far from a charity concert and was planned well ahead. Several record companies wanted to record the concert. Decca, which issued the 1990 concert, lost the bidding war to Warner. Also this concert was broadcasted live on TV and radio in many countries, and in the days and months that followed on TV all over the world. The audio and video recording of the concert was issued about a month later. The audio album sold quite well. The concert is still available on Warner CD and DVD (on the Atlantic label in the US and on the Teldec label elsewhere). 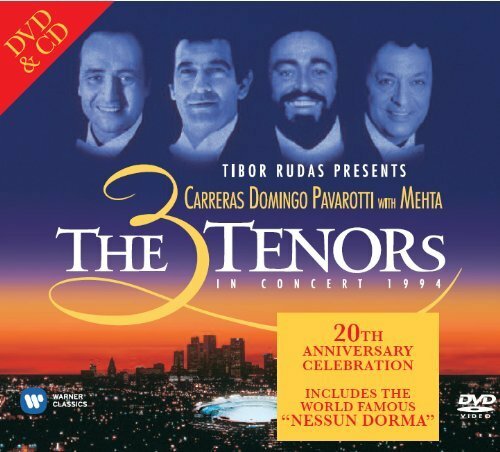 This Three Tenors concert also still sells good today 20 years after its first release. Hard to think that this concert happened 20 years ago this summer! Time flies! To celebrate this 20th anniversary Warner Classics has just issued a joint CD and DVD 20th Anniversary Celebration Edition of this concert. It also includes the video documentary “The Vision – The Making Of The Three Tenors In Concert 1994“. This is of course a must-have for all Three Tenors fans! This post was first published 12-07-2014. Last revision 12-07-2014. Posted in Luciano Pavarotti, Pavarotti, Pavarotti and football, Pavarotti's performances, Pavarotti's recordings, The Three Tenors on July 12, 2014 by Odd Pavarotti. Pavarotti and football (6): World Cup Fiesta & England Anthems! It’s time once again to mark the world football (soccer) championship (FIFA World Cup) which is held in Brazil this summer of 2014. There are two classical albums out to celebrate this event. 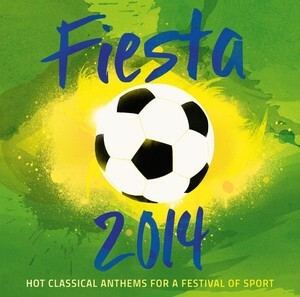 Deutsche Grammophon has issued an album with the appropriate title “Fiesta 2014: Hot classical anthems for a festival of sport“. This album contains 17 tracks from the Latin world of classical music. 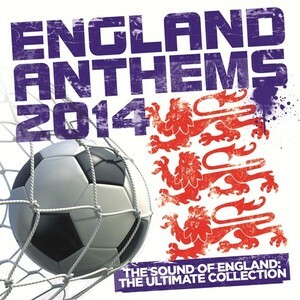 Decca has issued an album with the title “England Anthems 2014: The sound of England: The ultimate collection“. This album contains 20 tracks, mostly from world of English classical music. While “Fiesta 2014″ tries to capture the spirit of the host country, “England Anthems 2014” tries to burst moral for the England team in the World Cup. The album even contains God Save The Queen, Rule Britannia and excerpts from one of the Second World War speeches of Winston Churchill, followed by a song by Vera Lynn! Both albums are available on CD, download and streaming. What both albums have in common is Pavarotti as he sings the World Cup classic Nessun dorma! from the Puccini opera Turandot on both albums. On “Fiesta 2014″ it’s the classic 1972 studio recording and on “England Anthems 2014” it’s the live recording from the first Three Tenors concert in Rome in 1990. On both versions Zubin Mehta conducts. Enjoy the World Cup 2014 and may the best team win! But first, enjoy this fantastic video with Pavarotti singing Nessun dorma! from the Three Tenors concert in Paris in 1998. This post was first published 11-07-2014. Last revision 11-07-2014. The very first Three Tenors concert was held in Rome, Italy on July 7, 1990. After that first concert many more Three Tenors concerts followed, but this first one will always stand out as special. For many reasons. 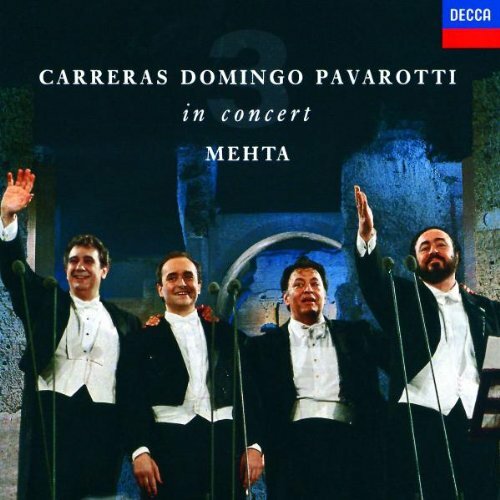 The joint concert between the Italian tenor Luciano Pavarotti and the two Spanish tenors Plácido Domingo and José Carreras was a surprise as the three tenors, and in particular Pavarotti and Domingo, were considered as tenor rivals. The concert was put together on relatively short notice as a charity concert and to mark the world football (soccer) championship (FIFA World Cup) which were held in Italy in the summer of 1990. The concert itself was held at the eve of the FIFA World Cup Final in Rome. The concert venue was indeed spectacular as the concert was held at the ancient Baths of Caracalla in Rome, which for years had been used as an outdoor arena for opera performances. The orchestra of Maggio Musicale Fiorentino and the orchestra of Teatro dell’Opera di Roma was conducted by Zubin Mehta. The three tenors sang four arias and songs each. Among them, Pavarotti sang “Nessun dorma!“ in glorious voice! From that very moment “Nessun dorma!” became a modern football anthem, forever associated with Pavarotti. The great surprise of the evening was that the three tenors also sang a medley of arias and songs together. An encore of “‘O sole mio“ followed, and an impromptu joint performance of “Nessun dorma!” concluded the concert. Needless to say, the concert was a huge success and started the Three Tenors phenomena. The concert was broadcasted live on TV and radio in many countries, and in the days and months that followed on TV all over the world. The audio and video recording of the concert was issued about a month later. The audio album is to this day the biggest selling classical album in world history. The concert is still available on Decca in every audio and video format known to man (except for Blu-ray), and it still sells over 20 years after its first release. After the 1990 concert The Three Tenors held many more concerts together during the 1990s and early 2000s. I’ve managed to count 36 Three Tenors concerts in total. In 1994, 1998 and 2002 The Three Tenors held their FIFA World Cup concerts. Several Three Tenors audio and video recordings followed. 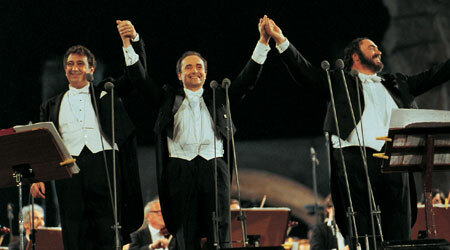 The very first Three Tenors concert in Rome, July 7, 1990 will always be special. It will never be forgotten. To remember that magic evening here is Pavarotti singing “Torna a Surriento“, followed by The Three Tenors singing “‘O sole mio”, first from the medley, then as the encore. This post was first published 07-07-2013 with the title “The very first Three Tenors concert in Rome, July 7, 1990”. Last revision 11-07-2014. Posted in Luciano Pavarotti, Pavarotti, Pavarotti and football, Pavarotti's performances, Pavarotti's recordings, The Three Tenors on July 7, 2013 by Odd Pavarotti. Pavarotti and football (4): We need more football songs! The Euro 2012, or the 2012 UEFA European Football Championship, is reaching its climax. Will it be Italy this time or will Spain go home with the victory in the final later today? To mark this Euro 2012 final we need more football songs! 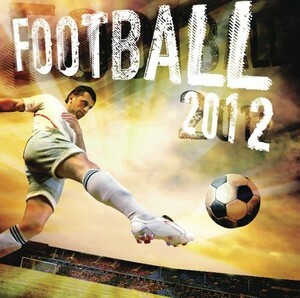 Decca is out with a compilation disc of football songs for this great occasion, with the simple title: “Football 2012“ (Decca, 1 CD, 2012, also on download and streaming). This CD has The Three Tenors singing “O sole mio” and Pavarotti singing “Volare” and of course “Nessun dorma!” from Puccini’s opera Turandot, in addition to 15 other tunes, both songs and instrumental pieces, with various artists. I’m not sure if all tunes featured here are favorite football tunes among the fans, but I love the concept of the album: Pompous, glorious, over the top tunes to belt out or sing along to whilst being occupied with the greatest game in the world! So good luck to all in the final! Enjoy the game! Here is Pavarotti singing “Nessun dorma!” from a Pavarotti Plus concert in New York in 1989. Have a great summer! Odd Pavarotti returns! Pavarotti and football (3): The Italian football job! The quarter-finals in Euro 2012, or the 2012 UEFA European Football Championship, are all over and done with. England is out and Italy is still in the game! Two countries, two different histories of football, and two different approaches to the game. 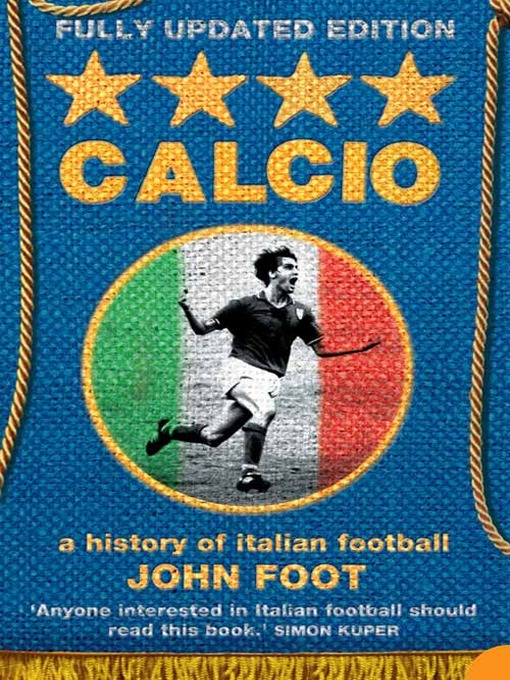 The first book on our summer reading list is “Calcio: A History of Italian Football“ (american title: “Winning at All Costs: A Scandalous History of Italian Soccer“) by the British historian John Foot who has modern Italian history as his speciality. John Foot is on Twitter where he tweets on Italy, sport and politics, among other things. 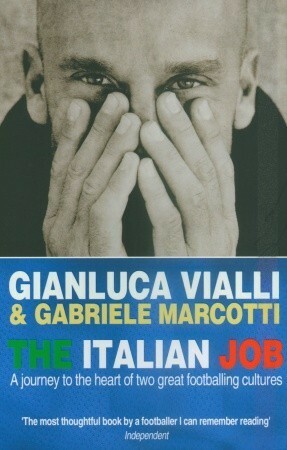 The second book for the beach this summer is: “The Italian Job: A journey to the heart of two great footballing cultures“ by Gianluca Valli and Gabriele Marcotti. The book compares, yes, you guessed it, English and Italian football. If this book can’t help us no book can! So, here is your chance to know more about Italian football, an important part of Italian culture. And you’ll learn something about English football as well! So let’s celebrate the joys of Italian (and English!) football with the The Three Tenors singing “O Sole Mio” in their second World Cup concert in Los Angeles in 1994 (available on CD and DVD). This concert was also broadcasted on TV all around the world, in many countries live. For some odd reason “O Sole Mio” is a football song as well, at least for some! Whatever makes the ball running!